Agenda is Non-wood turned objects demo: Guy Michael. Notice: the Clewes demo is this coming Fall. Upcoming meetings: May - kitchen utensils demo by Bonnie Glover. Videos up for Goblet turning and lidded boxes. Check homepage for links. 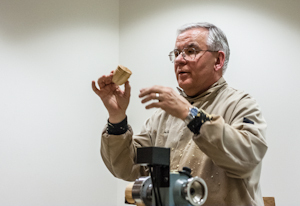 Main agenda item was Jim Gott demonstrating the making of lidded boxes. He made one in a short time, and covered the key elements in making any lidded box. Video at this Link. Presidents Challenge was Long-necked Goblet with a very good turnout. Show-and-tell also had a great turnout. 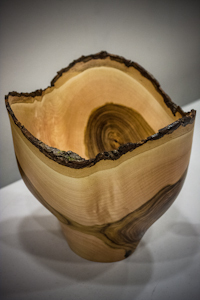 Bob Bley presented the piece at right, a pistachio natural edge with the pith centered, giving the higher and more prominent display of the heart wood. 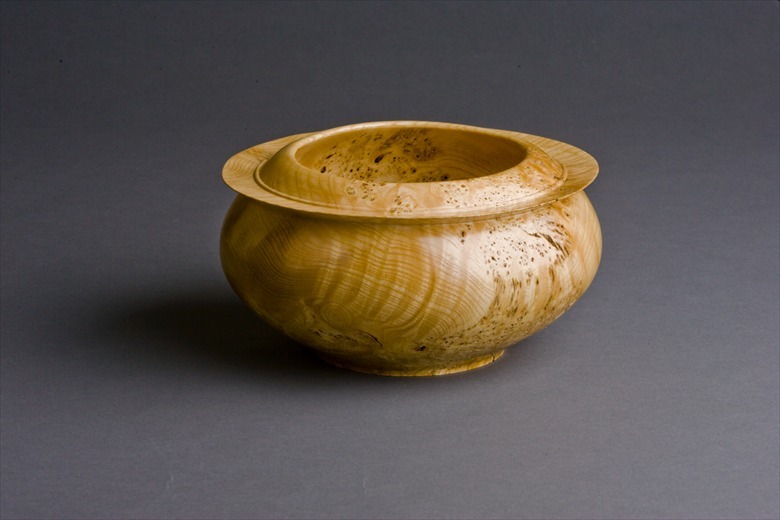 Starry showed us a madrone burl bowl, boiled in the manner done before. Lonnie showed a number of items including a goblet. 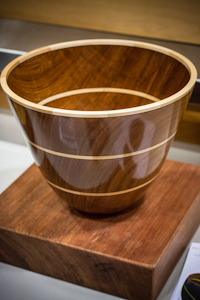 Tom Haines showed the segmented deep bowl below, made from pieces cut and stacked from a solid piece similar to what is in the pic. Peter displayed a thin necked goblet. Ask him about his special tool. 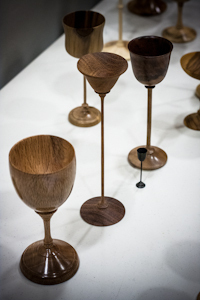 Budd Trapp had a cherry and elm natural edge pieces, the latter with stone inlays. Entrance fees are due by the end of April, after which the price goes up. The 3 local clubs will partner to make this happen, and it takes 20 committees to conduct a symposium. The page for our club is at Link, including the new logo. David Vannier is leading the charge for our club. More updates soon hopefully. The question was raised if there was interest in setting up a demo by Molly Winton. So please let Laura know if there is. 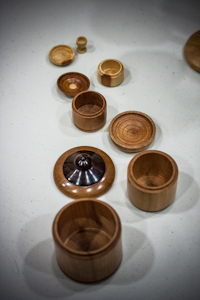 Eric of Woodcraft informed us that Facebook will soon have a woodturning shop. They are requesting some dishes for candy to be contributed. Stay tuned for more info. San Mateo Library is offering some display space, which direct sales to customers. New Officers were elected: Pat will return as President for another year, to be joined by David Vannier as Vice President (head of vice, always knew he was well qualified), Curtis Vose as Secretary, and Starry Chan as Treasurer. Hurrah for Edgar and the work he did. Thanks EW!! George Lutz delivered the first classes for the club. He also has a good idea of what the club wants. Great news that we can figure this out. May 19th is the date for the next class this one for intermediate and expert on a variety of items. Dan Schkolnik talked about the library, and the need for a digital version and not books or DVD's. Options for selling the hardcopy books will be explored. Laura spoke about the demos by Jimmy Clewes (rescheduled for the Fall) and Graeme Priddle (Saturday, May 5th - joint demo with Silicon Valley Woodturners). There is also a possibility of having Joey Richardson after the symposium in June. The acacia that was sold at the Feb meeting was Wattle Acacia. CA glue is available from Peter Pipe, who informs us that he now has a system for maintaining some inventory. You do however have to let him know of your needs. Thanks Peter. Jim informed the club that he is expecting to order more anchorseal, so we will see how that develops.